I rarely pour my heart out to anyone. I share many things with my husband or best girlfriend but there are always places in my soul I leave untouched – veiled. Maybe those places seem too dark or maybe they are just too painful. 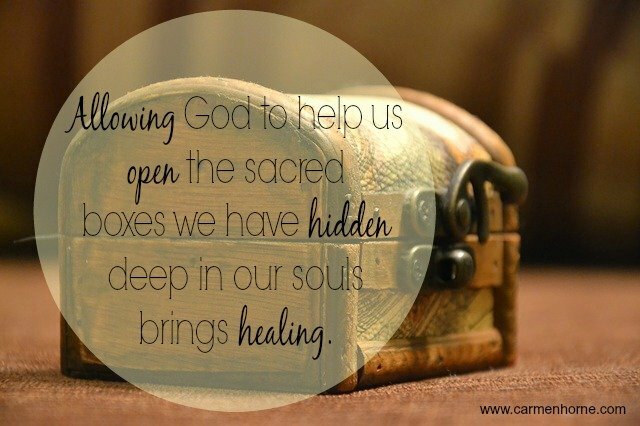 What do we do with the little sacred boxes within us that contain our hidden worries, hurts, disappointments and fears? Not only those things but our unrealized dreams that we can’t bring ourselves to vocalize? What if we say those dreams out loud and…what if they never become reality? Most often we carry them with us as a weight on our souls. We smile, go to our workplace, take care of our families and attend our church while ferociously guarding those secret places – even from our own view. If you are like me, you may have multiple boxes that you are trying hard to keep the lid on. You know those little “nesting” boxes? I have some cares that I have placed into the smallest box. I often try to deal with what I think is the main issue (the big box) but the lid seems to be stuck on that little box. Because, what’s in the little box is really what I’m running from. For me, the problem lies in trust. Do I trust God? Will I allow Him access to what I have concealed? He has proven Himself to me over and over yet I have buried some things so deeply, I am afraid to uncover them. I don’t question His love for me but I know that when that lid opens, He and I will have work to do. Hard work. The kind that sometimes seems worse before its better. I know because we have opened boxes before and it wasn’t a party. In the verse above David pleads with us to pour our hearts out to God. He reminds us that God can be trusted for He is our safe haven. I’ve been working on prying some lids off boxes. I’m working my way down. God lifts the corner but when I don’t think I’m ready, I push that corner right back down. In His patience, He waits. He waits because He knows me and He wants me to be well and whole. He knows that’s I want too. What do you have all neatly wrapped and hidden? What do you need God’s light to shine on so you can leave it behind? When you are ready, God is. He’s waiting for us to invite Him to the unveiling. Transparency with God might not be a party but it can be a celebration. This first appeared as a guest post for Kristi Woods’ Bearing Branch. Carmen, this is where my journals come is so well for me. Writing letters and notes and phrases and various other things to God allows me to begin lifting those corners and release begins to happen. I am grateful that I have that outlet for I don;t do well even praying these things or thinking in a quiet time. But the written word gives me a freedom I seem to find nowhere else. Yes, I need healing and want that as well. Allowing it to happen is hard but necessary for being the person God created us to be. Thanks for this honest and forthright post. Ahh Linda, journals. In a way that’s what I do on this blog. Talk about life and I am so glad when others like yourself stop in to talk about it with me. Writing is indeed a wonderful outlet and release. Thanks for visiting. Come again soon! Thank you Astrid. It is very tempting to just ignore those little boxes isn’t it? Your calling is a noble one. It is all of ours. Come see me again! A joy to have you linking up with us at #TellHisStory. Your words are grace-filled, hope-filled, shining with the love of Jesus. Write on, sister! Your words matter to God, and to His people! Thanks so Jennifer. I loved linking up. Thanks for cheering me on! Oh how I love this: Transparency with God may not be a party, but it is a celebration. Great words! I believe I read this post when you originally published it. But today it touches me anew and in different ways. There have been layers I’ve been peeling off my life – much like your boxes. Not always a party, but definitely a celebration! Beautiful post, friend! I’m so glad you stopped by for another visit on this post Ellen. Peeling back those layers is a part of the healing process. I’m glad God peels slowly aren’t you? Whew that process can be rough. Blessings to my friend! I completely understand. Lately, the lid has flown off of my little boxes, where the words and feelings are hidden, and I’ve sort of let them go, trusting God in the process. It’s been a difficult journey but there is healing in releasing. Thanks for sharing at The Weekend Brew! I love The Weekend Brew Barbie! It is good to just release all the junk we carry around to God and just be willing to work through the process. It’s like taking a splinter out of our finger. It hurts but the longer it is there the more painful it becomes. Blessings to you friend. I too have been working on getting some of those deeper things unburied and out in the light of Christ. I love the image of the nesting boxes–so true. We deal with the surface issue, missing the inner hurts and fears. What a blessing this post has been! I”m so glad you were blessed Ginger and so glad you stopped by for a visit! The uncovering is so difficult but so worth it. Praise God! Come see me again. Carmen, the arrow has pierced my soul. …….. I am sure every person reading this is like me….apprehensive…. and why should we be…. the God who chose us wants to heal us and make us whole…. He knows it…. but to reveal is to bring back hidden sorrows….wrapped grief….shadows of memories……tucked away but not forgotten….. Today… I believe you are digging just a little to deep….. for comfort…. but for healing…. the perfect way….. God’s way. Love you Carmen. Ahhh Judy, yes healing does have a painful stage. Sometimes brokenness is so familiar it just seems easier. You and I know better. Your comment is so beautifully written. You too hold a writer’s pen. Thanks for sharing your heart with us today. I love you right back sweet friend.